So, I must ask -- why am I just NOW finding out about coloring books for adults? I loved them as a child and now, with B.A. Landtroop's "Enchanted Waters," I am in love all over again. What I love the most about the artist's approach is how peaceful it makes me. Besides beautiful drawings to color, the artist provides peaceful words that relax me and makes the whole experience even more fun. "A Serenity Coloring Book," indeed. Thank you! "I am on my second order, I plan on a big order for a coloring book party soon. Love love love this coloring book. I am less stressed, and it is beautiful, and I love the note pages, I am journal-ling my thoughts and have started writing poems! The pictures are so beautiful you can frame them....I can not wait for the next one to release!!!! " Nature drawings drift across circles, squares and shapes creating fun art. Perfect to color as you drift in daydreams leaving stress behind. between art pages for more protection. Flowers,birds and animals wait in these pages for you to color them in your own wonderful way and relax. Enchanted Waters has an extra sheet between art pages for more protection. then you have a giving heart. of the book, then print and enjoy. Celebrate the Christmas holidays with this whimsical coloring book! Christmas Joy, A Serenity Coloring Book, is filled with a delightful cast of snowpeople and other holiday images. A perfect Christmas holiday gift for all ages. It.has an extra sheet between art pages for more protection. 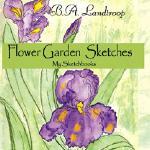 organize your Flower Garden sketches in one place. Making it easier to find the ones you need. 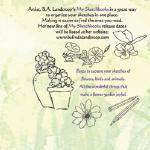 Pages to capture your sketches of flowers, birds and animals. All the wonderful things that makes a flower garden joyful. Start sketching the drawings only you can create!